This article deals with Roberto Rossellini’s famous Italian neorealist film, ‘Rome, Open City’ (Roma, città aperta, 1945), as well as Wolfgang Staudte’s, ‘Murderers Among Us’ (Die Mörder sind unter uns, 1946), one of the best-known examples of realist rubble films from post-war Germany. Cultural heritage is a communal process and films, as cultural products, can act as unifying factors for a nation’s viewers as well as for the architects of national identity. The article focuses on the ways in which these films can participate in the cultural heritage process and thereby affect the unity of a nation as a cultural heritage community. The cultural heritage process is maintained by using identity tools through which I analyse the cultural heritage built by post-war realistic films produced in two different nations. In this article, I will discuss how 1940’s Italian neorealist and German rubble films built the cultural heritage of the two nations as heritage communities after the devastation of World War II. I am using the term building instead of rebuilding as the post-war objectives were not about restoring the conditions of the nations to pre-war conditions. In post-war Germany, the original term rebuilding was replaced by the concept of new construction, which describes the process more authentically (Overy 2012, 62). This is also applicable to the post-war situation in Italy. I have previously examined how Italian neorealist films build and maintain the unifying cultural heritage of the nation . This article will expand the perspective on two post-war nations with different historical backgrounds, and in this case, the focus will be on two essential films from both countries and from the same period. Roberto Rossellini’s Rome, Open City (Roma, città aperta, 1945), the first, most successful and probably best-known neorealist film, has previously been a subject of my research. It portrays the struggles of a partisan group in Rome during the Nazi occupation in 1944. In this article, I will also focus on Wolfgang Staudte’s Murderers Among Us (Die Mörder sind unter uns, 1946), the first and most famous example of post-war German rubble films. 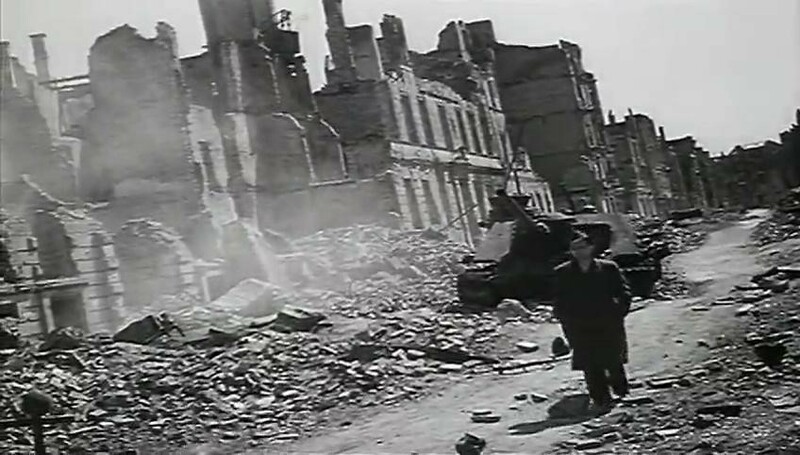 Rubble films refer to movies produced in Germany after World War II that focus on a particular historical situation, people’s post-war realities and the presentations of the ruined landscapes of bombed cities (Rentschler 2010, 9–10). Murderers Among Us concentrates on a former soldier whose war memories complicate his adaptation in the post-war society of ruined Berlin. I have chosen these two films because they are clearly ground-breaking in their respective societies and are probably the main works of their genres. As works of fiction, Italian neorealist and German rubble films were created under the burden of the war and ensuing post-war conditions, and can therefore reveal information about the circumstances in which they were made. As historian Marc Ferro has emphasized that compared to documentary films’ expression of reality, the imagination of fiction films can reveal valuable hidden information about their time and societies (Ferro 1988, 81–83). Additionally, historian Pierre Sorlin has found that the film holds a number of connections to elements such as the cultural habits of a period or society (Sorlin 2001, 31). Historian Hannu Salmi points out that film is a significant source for the study of collective mentalities, which also reflect the filmmakers’ own attitudes (Salmi 1993, 128). Therefore, a fiction film is a suitable source for studying the mentalities of communities. As collective mentalities and diverse societies are central to the analysis, it is important to clarify what kind of views are behind the films that may have influenced the outcome. A film is usually made by a larger group, so it is necessary to evaluate the authors of the source (Salmi 1993, 128). According to Ferro, for example, films can contain statements about society represented by institutions and ideologies such as the state or the church (Ferro 1988, 163). Due to the war, the production of Open City was not dependent on studio funding, which allowed it to be more artisanal, in fact, Rossellini himself raised the money to cover a large part of the film’s production costs. (Forgacs 2007, 28–31.) Italian culture scholar David Forgacs suggests that the film represents Rossellini’s Catholicism and writer Sergio Amidei’s communism in particular, which are the ideologies of the men behind the original concept of the piece. (Forgacs 2007, 14, 69.) It can be said that the result somehow reflects the alliance between communism and Catholicism that opposed German occupation and fascism. In turn, a Soviet film company, DEFA, produced Staudte’s Murderers Among Us, although Staudte first offered a manuscript to the Western Allied film officers (Fehrenbach 1995, 204; Shandley 2001, 20; Moeller 2013, 121; Baer 2009, 47; Rentschler 2010, 13). Staudte’s pacifist film was aimed at Germany’s National Socialist past; thus the film was well suited to the views of the Soviet occupation force (Moeller 2013, 120–121; Shandley 2001, 116). For example, Staudte had initially planned for the protagonist officer, Dr Hans Mertens, to murder his former Wehrmacht captain, Ferdinand Brückner, for his horrific war crimes against innocent civilians, however, the Soviet occupation censorship authorities wanted to change the end of the film so that the character did not become a murderer (Baer 2009, 31). In this light, at least to some extent, the film speaks for Staudte’s advocacy of pacifism and the ideologies of the Soviet Union. Sorlin also notes that while studying the societies of the time, the analysis of the film demands that that its favourable public reception is considered. (Sorlin 2001, 18–19.) Salmi has also stated that the films are a form of public dialogue; therefore, it is important to study a film’s reception as well. (Salmi 1993, 137.) At the time, these exemplary films were widely popular among the populace, so they can be considered as active participants in the shaping of the nation . The theory of documentary realism, developed by documentary director John Grierson in the 1920s, claims that documentary film is an important tool linking people and the state, while the purpose of documentary films is to provide a poetic sense of unity and fusion. (Aitken 2001, 162–166.) For film theorist Siegfried Kracauer, films – while capturing the visible world – reflect the mentality of the nation because they are collective products and strive to please the united people. (Kracauer 1966, 5–7.) According to Kraucer, while post-war audiences suffered alienation, emptiness and hunger but the physical reality of films represents an escape from modern society and a return to life. (Kracauer 1960, 167–169.) Spectatorship is also the basis of the theory of cinematic realism advocated by one of the most influential film critic of Neorealism, André Bazin. Based on the invention of the photograph and its ability to freeze a particular contemporary phenomenon, Bazin states that film has the obligation to document the phenomena of the world in a realistic way and that cinematic projection brings the filmed phenomena back to life to satisfy the human needs of spectators (Cardullo 2011, 4–5). For the major realist film theorists Grierson, Kracauer and Bazin, the phenomena of unity displayed in national films can satisfy the spectator’s hunger for life in the nation as community. In this context, I am interested in discovering how these realistic films, as part of their nations’ cultural heritage, with their focus on social problems and difficult circumstances, are able to build a national or communal identity. According to historian John Dickie: ‘Individual cultural documents such as films can tell us a great deal about what being a national involves because they construct the nation’ (Dickie 1996, 25.) Even though Italian and German societies had completely changed after the war, the cultural heritage of the nation can still be examined, for example, through films as cultural heritage endures for future generations, while new heritage is also created. This view is reflected in the definition of cultural heritage of the international council on monuments and sites (ICOMOS): ‘Cultural heritage is an expression of the ways of living, developed by a community and passed on from generation to generation, including customs, practices, places, objects, artistic expressions and values. Cultural heritage is often expressed as either intangible or tangible cultural heritage’. (“A Cultural Heritage Manifesto” 2015) Therefore, I aim to answer the following question: How do these post-war realist films from Italy and Germany participate in the cultural heritage process of the nation as a heritage community and how do they unite its members? In the present study, the nation is a cultural heritage community and films, as part of the nation’s cultural heritage, are also involved in the construction of identity. Cultural heritage is a communal process, in which the heritage community accepts the interpretations of the past (Sivula 2015, 57). In the analysis, I use the theory of the identity work of the cultural heritage process and various interpretations of national identity. My goal is to compare these films’ ways of building a unifying heritage and the analysis is based on the close reading method. In the case of film culture and unifying the cultural heritage of two nations as communities, it is important to look at the definitions of nationality, nation and identity. For nationalism scholar Ernest Gellner, the nation’s membership requires sharing the same culture, which is the system of ideas, symbols, behaviour and communication, and the nation is created when the residents of a certain region recognize common rights and obligations to each other for the benefit of their shared membership (Gellner 2008, 6–7). This duly means the recognition of other individuals as companions. The recognition of each other is also part of nationalism scholar Benedict Anderson’s definition of the nation as an imagined community. According to Anderson, Print technology and print-language made possible new kinds of imagined communities, which are the foundation of the modern nation (Anderson 2006, 48). Anderson’s well-known idea is that the nation is an imagined community, although the members of the nation do not know each other, nonetheless they still feel a sense of community (Anderson 2006, 6). In this context, film historian Alan Williams sees that the invention of recorded sound in film technology has been affected in the same way as print technology (Williams 2002, 2). It can be said that, national films can be used to imagine the nation because they can create a sense of community, without contact with other fellow citizens. Based on Anderson’s idea of the imagined communities, cultural theorist Stuart Hall argues that national culture as a discourse builds identities, which can be found between the past and the future as part of the representation of the nation to which people can identify with. For example, in an imagined community, we are part of the nation’s narrative, which includes national symbols that represent shared experiences and historical events. Additionally, the emphasis is on the origin, continuity, tradition and timelessness, which are related to the illusion that the essential features of the nation have remained unchanged. (Hall 1992, 292.) For imagining communities, the essential parts of the identity are a traditional narrative with the concept of continuity, which provides valuable national meanings to identify with and that can also be traced from films. According to heritage scholar Anna Sivula’s article about commissioned histories, a heritage community maintains the cultural heritage process by using different identity tools. First, shared history means knowledge and interpretation of the past, which places the community within the continuity of past, present and future. History is inclusive whereby the members’ contact with the past strengthens the affiliation to the community, while it is exclusive for those who do not feel that inclusion. Shared history can be used as a framework for cultural heritage. Second, an experience of involvement occurs when members experience the inclusion of shared history and traces of the past. Third, the traces and symbols of the past that serve as evidence of shared history, and to which members of the community feel that they are involved. Shared history can be used to strengthen the symbolic position of the meaningful trace of the past in which case we speak of monumentalizing identity work. When the heritage community adopts a trace of the past or a symbol, it refers to possessing identity work, which means strengthening the heritage community’s experience of involvement with this trace or symbol. Historicizing identity work reinforces the image of oneself with the continuity of past, present and future, and contributes to the formation of the shared history. The cultural heritage process requires constant historicizing, monumentalizing and possessing identity work, which will enable the community to maintain its own cultural heritage. (Sivula 2015, 64–67.) Actually, monumentalizing identity work refers to the concept of institutionalization that geographer Anssi Paasi has used in connection with the formation of the regions. Institutionalization means the process in which a certain geographical area in society gradually emerges and develops into an entity with a status and regional identity of its own (Paasi 1986, 11). So, the process means that the region becomes gradually institutional just as the monumentalizing identity work strengthens the status of a certain trace of the past in the cultural heritage process. 1930s Italian cinema and film directors Alessandro Blasetti and Mario Camerini strongly contributed to the development of a new kind of film in the post-war period. After their violent rise to power, the Fascists sought to hide their dark past through cinema by sponsoring films showing the peaceful Italian countryside and its unknown people. Some key works of the regime’s “Ruralize Italy” -period were Alessandro Blasetti’s Sun (Sole, 1929) and Mother Earth (Terra Madre, 1931). (Brunetta 2009, 68–70.) Blasetti’s 1860 (1934) is a historical film about Garibaldi’s invasion of Sicily during the Risorgimento. The film is an important precursor to Neorealism, because it uses location shooting, non-professional actors, the local dialect, scenes of peasant life and a rural landscape. (Shiel 2006, 24; see also Bondanella 2009, 26.) The Italian neorealist movement developed during the Fascist regime when many of the neorealist filmmakers participated in the Fascist film industry and gained valuable technical training before the emergence of Neorealism. (Bondanella 2009, 52.) In 1926, the Fascist regime founded the Film Institute L.U.C.E (L’Unione Cinematografica Educativa), which produced fascist documentaries and newsreels aimed at maintaining political power. Later, the Fascists expanded their influence to fictional films when Mussolini noticed that films are ‘the most powerful weapon’. (Shiel 2006, 21.) When the Fascists realized the power of cinema, they founded a film school, the Centro Sperimentale in 1935 and opened the large Cinecittà studios in 1937. (Cardullo 2011, 19.) For example, Carmine Gallone’s famous historical spectacle Scipio Africanus (Scipione l’africano, 1937), was reminiscent of Italy’s glorious past and brought ancient Rome to the screen. In turn, Francesco de Robertis’s Men at the Bottom (Uomini sul fondo, 1941), is a fictionalized war documentary of the late Fascist period, which represented heroism without triumph or belligerence. (Brunetta 2009, 92–93.) Interestingly, the film also uses real locations and nonprofessional actors. (Ben-Ghiat 2000, 23; Liehm 1984, 44.) Further, the so-called Telefoni bianchi comedies were popular because ordinary Italians didn’t want to conquer the world but rather to have a steady job, a regular wage and a decorated modern home. These films therefore depicted a luxurious and carefree life, which diverged from the wartime reality. (Brunetta 2009, 97; see also Spinelli Coleman 2011, 86; see also Shiel 2006, 25.) Therefore, the typical films of the Fascist period are glorious historical films, realistic war documentaries and light-hearted, escapist comedies. Before the period of Neorealism, Roberto Rossellini worked as assistant director and co-screenwriter on Goffredo Alessandrini’s Luciano Serra, Pilota (1938), which was supervised by Il Duce’s son, Vittorio Mussolini. A few years later, Rossellini directed the military “fictional documentary” La nave bianca (1941) under the supervision of the Fascist filmmaker, Francesco De Robertis. The film emphasized the efficiency of the Fascist regime’s navy operations. (Ben-Ghiat 2000, 23; see also Liehm 1984, 43–45.) Actually, Vittorio Mussolini was quite a progressive figure and anti-fascists regarded him as “a good guy”. He was also the editor of the avant-garde film journal Cinema, whose editors created Ossessione (1942) together with director Luchino Visconti. (Brunette 1996, 7.) Compared to Visconti and his Cinema journal collaborators, it can be said that Rossellini’s relationship with the Fascist film industry of the 1930s was the most obvious of his neorealist contemporaries. Italian films of that era weren’t propaganda compared to Nazi Germany’s productions as the Fascist regime highlighted sentimental nationalism, loyalty, courage and the efficiency of war preparations. Even propaganda films were not subjected to political pressure except for newsreels, which played an important role in propaganda and were closely monitored. (Brunette 1996, 8; Brunetta 2009, 69.) During the war years, films helped viewers forget the horrors of the conflict as films were intended to emphasize the values of humankind and not the nation’s success. (Brunetta 2009, 74.) The common view is that Fascist films – except documentary newsreels – were not as focused on the manipulation of the people as was the objective of German propaganda films. For example, Visconti was able to make Ossessione in Mussolini’s Italy, a film that would have been impossible to produce in Nazi Germany. Roberto Rossellini’s Rome, Open City (1945) was made immediately after the war, so it symbolically reflects the atmosphere and the tragedy of the German occupation of Rome and the fight of the Italian partisans. It has been seen as the obvious cornerstone of Italian Neorealism and a new kind of cinema. The production conditions and limited financial backing, for example, forced the use of location shooting, sound dubbing and poor black-market film stock, which became some of the well-known characteristics of Italian Neorealism. (Bondanella 2009, 67.) For his part, film scholar Christopher Wagstaff claims that Neorealism is too often mainly defined by these ostensible characteristics, despite the fact that the filmmakers have been of the opinion that neorealist films are simply a reaction to the current situation and expressions of their wartime experience. (Wagstaff 2000, 38.) Film scholars Laura E. Ruberto and Kristi M. Wilson have also noted that if we look at films that are considered neorealist, it is clearly observable that they do not follow the rules of Neorealism and that Neorealism cannot be considered an organized school. For example, De Sica’s Bicycle Thieves was made with a massive Hollywood-style budget; Rossellini, for his part, used professional actors in Open City and the film itself was heavily scripted. (Ruberto & Wilson 2007, 9–10.) It is clear that certain, defined characteristics are part of Neorealism, but these are just minor points, which are often taken up in connection with Italian Neorealism. The most famous neorealist scriptwriter, Cesare Zavattini, brought together the basic idea of neorealism without any technical details: ‘The task of the artist – the neorealist artist at least – […] consists in bringing them to reflect […] upon what they are doing and upon what others are doing; that is, to think about reality precisely as it is’. (Zavattini 1978, 67-68.) Zavattini’s guiding principle is therefore that the neorealist filmmakers must observe the surrounding world and society and bring the phenomena to the screen. Because the movies do not follow a clear program and the basic idea is quite abstract, Italian Neorealism cannot really be regarded as a fully unified genre or movement. The re-opening of Cinecittà-studios in 1948, the return of the genre-films and the increasing impact of the Hollywood films – as a result of Marshall Aid – in the late 1940s, contributed to the decline of Neorealism. In any event, the government and the people longed for more cheerful films. (Shiel 2006, 84–87; Piturro 2008, 38–39, 162–163.) In addition to the influence of the United States, the election victory of the Christian Democrats in 1948 reduced the influence of the Left, which also contributed to changes in film production. Historical epics, such as Alessandro Blasetti’s Fabiola (1948), were popular from the late 1940s until the early 1960s. (Wood 2005, 69–70.) In other words, Neorealism was a movement that was related to war and the social problems of post-war Italy. Film production expanded as many wider problems came to an end and the economy improved in the late 1940s. Before the Allies took control of the four administration zones, the final film of the Third Reich was propaganda film director Veit Harlan’s film Kolberg (1945), which premiered in January 1945. In the eastern area of Germany, film production began shortly after the war, but the Western Allies avoided the dangerous influences of the past. Hollywood knew how to take advantage of this big void in Germany and the Germans were able to watch foreign films again. (Sandford 1980, 9.) The directors, producers and actors of the rubble films already took part in the industry during the Third Reich. For example, Wolfgang Liebener, the Nazi-era director, continued his career after the war by making rubble films. (Shandley 2001, 6.) Also, Wolfgang Staudte acted in the Veit Harlan’s anti-Semitic propaganda film Jew Süss (Jud Süß, 1940) although he later stated that he was practically forced to take part in. (Fehrenbach 1995, 207.) Thus, in both countries, the post-war filmmakers in the realist tendency also worked in the film productions of totalitarian systems in Fascist Italy and Nazi Germany. Initially, the reviewers invented the term “rubble films” in a derogatory fashion in 1947 as the audience was already tired of the gloomy mise-en-scène of these films. When the conditions of broader German society changed as a result of the polarizations of the Cold War, viewers quickly lost interest in the rubble films because they no longer wanted to see post-war problems presented in films. (Shandley 2001, 8.) The 1948 reform and the growth of wealth reduced the number of viewers even further. (Moeller 2013, 19.) As has previously come to light, the situation was also similar to Italian Neorealism. It is clear that the events of historical films provide a valuable framework, both to tell a story truthfully and to convince the audience of the greatness of a nation with the aim of constructing national identity. A filmmaker, as an artist, is an essential narrator of national symbols, myths and memories. (Smith 2000, 48–52.) According to scholar Maria Wyke, related to the problematic unification of Italy in 1861 and heterogeneous Italians, historical films of the Roman Empire can be considered as Eric Hobsbawm’s “invented traditions” that promoted the continuity of the nation with a suitable past. The purpose was to strengthen national cohesion and justify certain contemporary political events through the use of a glorious history. For example, Carmine Gallone’s Scipio Africanus (1937) was related to the African campaigns of 1935–36 conducted by the Fascist regime and introduced general Scipio as the perfect Fascist. (Wyke 2008, 63–65.) The historical films of the Third Reich also relied on the presentation of the great leader, be it Wolfgang Liebeneiner’s Bismarck (1940) or Veit Harlan’s The Great King (Der große König, 1942). The representations of the historical leaders as rebels and tyrants were linked to Hitler and the reason for this was the use of history for propaganda purposes. (Hake 2004, 82–83.) These kinds of hero characters are symbols of the common past, creating continuity and building national identity through the shared history of the cultural heritage process. Rossellini’s Rome, Open City also represents the past. First, the story is based on the executions of the two partisan priests from the Italian resistance, Don Pietro Pappagallo and Don Giuseppe Morosini, at the time of the German occupation of Rome in 1944. Second, the film is also based on the spontaneous street execution of a pregnant woman, Maria Teresa Gullace, in 1944. (Forgacs 2007, 14–16.) In a film, without any hesitation or despite the dangerous task, the partisan priest character Don Pietro Pellegrini smuggles money to the partisans at the request of leftist partisan hero, Giorgio Manfredi, a.k.a Luigi Ferraris. Later, Don Pietro confesses his loyalty to the partisans when he acquires false identity papers for Giorgio. In Don Pietro’s execution scene, a group of weak Fascists receive the execution command, but the almost immortal partisan priest does not die. This leads to an embarrassing situation in which the German captain Hartmann will have to shoot the priest by himself. A group of boys arrives whistling behind a fence nearby to honour their dying teacher, Don Pietro. Another well-known scene is the slaying of a pregnant Pina, which takes place when the Germans unexpectedly arrive at the house of the partisans to perform Giorgio Manfredi’s arrest. As a result, German soldiers shoot brave Pina on the street, as she runs after her captured partisan husband, Francesco. Nationalism scholar Anthony Smith uses the term ‘usable past’, when the communal themes from the past, such as civic virtue and heroism, can be chosen for imagining and constructing the nation. (Smith 1997, 37.) David Forgacs points out that the film does not present any tourist landmarks or monuments, such as the Colosseum, the Roman Forum or Mussolini’s Piazza Venezia, as the film aims to connect the city of Rome to the resistance of ordinary people during the German occupation, rejecting the traces of the Fascist regime. (Forgacs 2007, 69.) As I have presented, representing shared experiences and common historical events, partisan heroes as representatives of the community can be seen as symbols of the nation’s narrative. Therefore, in this case, the nation can be seen as a heritage community that builds the cultural heritage. From the viewpoint of shared history, the partisan movement and occupation act as a framework for the heroic characters of Don Pietro and Pina, meaningful symbols of the immediate past, which can be thought of as part of the monumentalizing identity work of the cultural heritage process. (Leikas 2016, 57–58.) It can be said that the Italian partisan movement, as it relates to recent history, is a suitable theme for historical films that can lead to various interpretations of shared history of that period. For Rossellini and Amidei, an important left-wing Partisan movement cooperating with Catholicism provides a “usable past” for construction of the nation. However, Open City is predominately a story of the period of repression that took place during the German occupation. Hungarian politician Gerorge Schöpflin has stated that myths and symbols act as builders of coherence and a nation’s myths of redemption and suffering represent powerlessness and compensation for the oppression of the occupying forces (Schöpflin 1997, 29–35). As film historian Mark Shiel has pointed out, Pina represents both the resistance of ordinary people and the Catholic faith that is shown through the close relationship between her and the priest Don Pietro (Shiel 2006, 49). In Pina’s dramatic death scene, Don Pietro symbolically holds her dead body in his arms after she has been sacrificed for her partisan and Catholic community. The relationship between these characters and their horrible destinies expresses the importance of religion to Rossellini. Related to the history of the partisan movement and characters above, Rossellini’s film is about the redemption and suffering of the nation as a community. According to heritage scholars William Logan and Keir Reeves, a nation’s shameful and painful past is represented in places like genocide sites and prisons, but afterwards, this brutal side of history becomes regarded as heritage and remembrance is maintained, for example, through films (Logan & Reeves 2009, 18–23). Accordingly, the film – based on real historical people – is a good example of difficult heritage” because it recalls memories of the painful times of the nation’s past. Video 1. Rome, Open City – The Death of Pina can be seen as “difficult heritage” that witnesses the painful side of the nation’s history. I have also maintained that these tragic events and the destinies of the characters can be seen as Realms of Memory, which unite the heritage community in remembrance of the past and thus, the sense of unity is strengthened. In this case, the film builds cultural heritage also by possessing identity work, which reinforces the culture heritage community’s involvement in these traces and symbols of the painful Italian past. (Leikas 2016, 58–59.) Rossellini’s film helped Italian post-war society sustain the memory of the heroic left-wing partisans as well as the painful events of the past. In the film, these are presented in the death and torture scenes of the common Italian heroes. The scenes consequently strengthen the imaginary cohesion of the heritage community. Italian Neorealism and German rubble films are derived from different conditions. As Neorealism began as an aesthetic resistance movement that opposed fascism, rubble films essentially responded to the spectators’ need to identify with something in the time of post-war disillusionment. (Shandley 2001, 49.) Rentschler points out that German war survivors made a tremendous effort to regain themselves and found a national community. (Rentschler 2010, 17.) Neorealist films reacted against the banal film culture of the Fascist-era and against existing socioeconomic conditions in Italy. (Cardullo 2011, 19.) After Hitler and the Holocaust, there was no potential history rooted in the past for identity building or increasing national pride in Germany. (Fulbrook 1997, 74–75.) However, Jaimey Fisher has stated that the trauma experienced by the individual – Partisans, Workers and the Heimkehrer – acts as a connecting factor in Italian Neorealism and German rubble films. For example, the partisan male heroes of the Open City experience humiliating and traumatic deaths and the male protagonists of Bicycle Thief and Umberto D. fail to provide financial security for their families, which can be associated with the traumatic male characters in rubble films. (Fisher 2007, 27–30.) I disagree with Fisher that the partisans are treated humiliatingly as the characters die as heroes, but I do think that there is a similarity in the hopeless situation experienced by the male characters in neorealist and rubble films. This type of desperation for male characters, as in Murderers Among Us, is also particularly apparent in De Sica’s films. Although foreign escapist feature films were popular in Germany, rubble films dealt with everyday problems of Germans and their shared feelings of anxiety, guilt and fear, thus individuals were not alone with their emotions. (Baker 1995, 98.) According to Martina Moeller, the devastated city landscape in rubble films represents traumatic events and the vital need for a fresh start in the middle of the crisis. (Moeller 2013, 13.) George Schöpflin points out that unifying myths of unjust treatment emphasizes the helplessness of communities that have encountered terrible collective experiences. (Schöpflin 1997, 30–31.) Hence, in this case, according to Benedict Anderson’s theory, traumatized Germans in the post-war period had a chance to imagine a community through watching rubble films and, therefore, they experienced the imaginary companionship. Murderers Among Us, the standard-bearer of the German rubble films, does not contain similar stories of heroes, religious sacrifices, the symbols of the nation’s narrative, the ‘Golden Age’ or usable past, as does Open City. In Murderers Among Us, the character Dr Hans Mertens is a former soldier and a Heimkehrer who suffers from the severe traumas of war and he desperately wanders through the ruins of Berlin. Jaimey Fisher has proposed that the film interprets the past and collective history via the wandering Dr Mertens, who like Flâneur in the city, is troubled by the voices of the Nazi past and memories that the ruined city landscape has evoked (Fisher 2005, 472). Additionally, scholar Hester Baer has noted that Dr Mertens’ blurred and disturbed gaze refers to his past traumas, which are triggered by different stimuli in the present day, for example, as a doctor, he cannot stand the sight of blood (Baer 2009, 34). In Murderers Among Us, the traumatic past, aroused by the ruined landscape and war-related stimuli, unites the imagined community to remember the immediate past, as Realms of Memory. Thus, it unites members of the heritage community in remembrance of the past. In this case as well, when the nation as a heritage community adopts the traces of the traumatic past, the film builds cultural heritage by possessing identity work. In the state of post-war disillusionment, some traces of identity can be found through shared experiences revealed by films as cultural artefacts. Image 1. Murderers Among Us – A wandering Dr Hans Mertens amongst the ruins of Berlin as Realms of Memory that allow members of the heritage community to remember the past and its ruined landscape. Video 2. Murderers Among Us – Dr Mertens compares the chess game to the war zone, which raises painful memories of war; common traumatic memories can also be used to build cultural heritage. Often within the various nations, the governmental authorities have deliberately ignored some of the memories related to a nation’s cultural heritage or created invented traditions that have sought to support a particular nationalistic policy. (Logan & Reeves 2009, 20.) Thus, some aspects of national identity have been abandoned because of the negative past. As I mentioned in the context of Open City, Murderers Among Us is a perfect example of the traumatic and brutal side of history and “difficult heritage”. In this context, the film is also linked to the German history of suffering because it maintains memories of post-war suffering. For example, according to German historian Helmut Schmitz, the history of suffering emerges in the form of a Holocaust memorial in Berlin that has brought the Nazi crimes back to the memory culture and has institutionalized the Holocaust in contemporary Germany (Schmitz 2007, 3). In this way, Murderers Among Us and other rubble films have participated in the presentation of Germany’s history of suffering in the 1940s and have also contributed to the institutionalization of the Nazi past in the post-war years. Although, as Schmitz notes, the theme of wartime suffering has been a taboo subject and therefore it has still not been adequately remembered in modern Germany (Schmitz 2007, 5). Some myths of nation building, expressed by Schöpflin, are also concerned with the future. The main idea of myths of renewal is that the present has been spoiled by violence from another community, however, purification can create a better world for the future and a fresh start. These kinds of myths were particularly evident in Germany and Italy after World War II. (Schöpflin 1997, 32–33.) As Anthony Smith has stated, the memories of the golden age will help shape the future of the community. (Smith 1997, 51.) In Open City, community’s – left-wing partisans and Catholics – gaze into the future and signs of rebirth are displayed after the execution scene of Don Pietro, when the priest’s young pupils leave and walk towards Rome with cheerful music playing. This final scene of the film reveals that although the pupils are sad, they walk towards the future with optimism. In this instance, if we consider the nation as a heritage community, this scene reinforces the image of oneself within the continuity of past, present and future, and, therefore, shared history is formed and cultural heritage is built by historicizing identity work (Leikas 2016, 60). Again, the scene also emphasizes the importance of religion for to Rossellini because the sacrifice of Don Pietro will lead to purification when the new hopes of the nation make a fresh start and thus, the myths of renewal occur. Video 3. Rome, Open City – The execution of the partisan hero of the past, Don Pietro, and the road towards a better future with children. Thus, the myths of renewal emerge and shared history is formed. Desperate Mertens does not think about the future, while his roommate Wallner, as an artist, has painted optimistic sketches about “saving children” and cleaned up the ragged apartment. However, Mertens disapproves that Wallner sees a hopeful future. Mertens, as a doctor, believes that there is no point in saving humankind and again he goes wandering around the ruined city. In the most famous scene, Mertens displays his nerves to Wallner who intervenes in his affairs. He does not want to forget the past and, therefore, a despondent Wallner goes out to the ruined city. Later, a repentant Mertens finds Wallner and promises to love her some day while hopeful music plays. Mertens represents the traumatic past and Wallner aims towards a hopeful future, as does the entire nation. It can be said that, more than Open City, the film veers significantly towards a promising future due to Wallner’s actions. According to war historian Richard Overy, in post-war Germany, where many had lost their homes and possessions, moving forward was the only option (Overy 2012, 62). Rentschler confirms that: ‘[T]he Trümmerfilm is more concerned with moving forward, with reconstructing the nation rather than reconsidering its past’. (Rentschler 2010, 14.) This current state of society is therefore well represented in Staude’s film. The communities presented in the film differ from Rossellini’s Open City, because partisans and Catholics are closely linked, but in Murderers Among Us, former Nazi Captain Mertens is clearly different from Wallner, who again symbolizes a new post-war Germany that looks towards the future. For this reason, the film clearly represents Staudte’s and DEFA’s view of rejecting National Socialism. The film, and especially Wallner’s character, participates in the historicizing identity work of the cultural heritage process and thus the spectator’s image of oneself, on the continuity of past, present and future, is strengthened. Video 4. Murderers Among Us – The famous scene in which the protagonists can see a promising future, which means that the film reflects a forward-looking German society. The nation can also be imagined as an integral geographical space, for example, as a cityscape with geographic boundaries that differentiate us from other. (Dickie 1996, 22–23.) Tim Edensor has pointed out that the relationship between geographical space and national identity often focuses on symbolic landscapes and famous sites, but everyday spaces are equally important builders of the national identity. Mundane and familiar things constitute a sense of place. (Edensor 2002, 50–51.) As previously noted, Open City does not contain any tourist landmarks or monuments. The same applies to the ruined city of Murderers Among Us. Italian historical films, such as Gallone’s Scipio Africanus, are unique icons, which build national identity based on the glorious past and for outsiders, they are the authorities’ representations of the golden age, which testify to the greatness of Italy (Leikas 2016, 62). It can be said that the Prussian film genre of the Third Reich, including Veit Harlan’s The Great King, shared the same objective. As I have stated, in Open City, home is presented as a mundane shelter and retreat for Roman partisans where the war cannot reach. The home, as the safest place in the film, serves as a base and hiding place to keep away from the German occupiers. Home is strongly related to national identity through the differentiation, when home separates Italians and German occupiers from each other. The film presents an Italian family and a home that does not belong to the invaders. In this sense, the home can be seen as a suitable trace for the possessing identity work of the cultural heritage process. A scene from Open City where Giorgio Manfredi and Francesco eat at home best illustrates home security. They casually discuss the situation of the resistance movement and their future plans until Francesco’s future wife Pina arrives. After a while, they hear an explosion and Pina turns off the lights. They are monitoring the situation from the window and Pina’s son Marcello arrives home from the site of the explosion. The home represents the community with boundaries used to distinguish the main characters from outsiders. (Leikas 2016, 65.) Edensor has proposed the idea that a home is like a private nation with differentiating boundaries (Edensor 2002, 57–58). The sense of community, presented in the film, occurs in everyday life at a family’s home and imagining the community becomes possible when the community is placed against the outsiders. The nation as a heritage community may use this pattern for identity work. Journalist Luigi Barzini emphasizes the importance of women in Italian society, as women work imperceptibly to maintain the family and the entire nation. (Barzini 1991, 227.) Although Francesco and Giorgio are the partisan heroes of the film, the mother figure Pina makes the ultimate sacrifice, as she fights for her family until her heroic death at the hands of German soldiers. In the cultural heritage process, Pina, as she sacrifices on behalf of the community, is an ideal symbol for possessing identity work. (Leikas 2016, 68–69.) As has been revealed in connection with Murderers Among Us, compared to the suffering Dr Mertens, Susanne Wallner, a concentration camp survivor herself, has a clear picture of the future. Wallner cleans, cooks and organizes the home, although the drunken and wandering Mertens does not want to restore order because of the trauma of the past. If we consider a home as a private nation, a strong woman dominates it, while the traumatized man, alternatively, wanders helplessly outside in the ruins of the city. The family and the mother figure are also important elements in Vittorio De Sica’s Bicycle Thieves. I have stated that the film builds a community’s identity through a woman-dominated home where private is distinguished from public. The helpless men of the film, Antonio and his son Bruno, are leaving from home, which is dominated by a strong mother, Maria, and the feeling of home fades along with her, as husband and son head out into the city in a desperate search for lost bicycle from the crowded streets of Rome. (Leikas 2016, 67–68.) Additionally, film scholar Henry Bacon sees Maria’s home as a shelter, but misfortunes and social conditions drive Antonio and Bruno to endless wandering in the city (Bacon 1996, 75). A similar situation is also reflected in De Sica’s Umberto D. (1952), in which a housemaid, Maria, maintains the home. Similarly, Murderers Among Us presents a helpless man whose home is maintained by a strong woman. At first, his war trauma seems to be too deep, but eventually Mertens’ healing process begins with the assistance of Wallner. In these essential films that represent the difficult post-war years, there is a shelter for poor men, maintained by a strong forward-looking woman. It seems that men have failed at war, so women must restore order. In Murderers Among Us, Susanne Wallner’s home serves as a unifying symbol for possessing identity work, which the post-war nation, as a heritage community, can absorb into the construction of uniting cultural heritage. Image 2. Murderers Among Us – An apathetic Dr Mertens and a female-dominated home as a uniting symbol for the heritage community. As John Dickie has stated: ‘The opening sequence of Roma città aperta encapsulates its dominant system of differentiation. […] The Nazis are […] the film’s central image of an evil Other’. (Dickie 1996, 25.) I have noted that Rossellini has created a clear contrast to the partisans, which is visually expressed through the German uniforms. At first, the German occupying forces appear to be a strong authority but later the film presents the German leader, Major Bergmann, as an unmanly and abnormal character, who can be seen as a threat to the traditional nuclear family of the Italians. This pattern of differentiation is widely used in representations of the alien invasion. (Leikas 2016, 74–75.) According to Kimmo Ahonen, the threat to “normality” is also a typical feature of the 1950s alien invasion films of Hollywood. (Ahonen 2013, 214.) As has become clear, the Italian partisan family can act as a unifying factor for heritage community. I have stated that Pina’s sister Lauretta and her friend Marina Mari, who prefer a luxurious life and cooperate with the German soldiers, also threaten the nuclear family and that they are different from the left-wing partisans. (Leikas 2016, 71–72.) Further, David Forgacs has noticed that the film has a polarizing arrangement where the working-class community is set against the world of the cabaret girls, Marina and Lauretta (Forgacs 2007, 45). In Murderers Among Us, the enemy of the community, represented by Mertens and Wallner, is his former captain and a comrade-in-arms Ferdinand Brückner who is responsible for the killing of civilians in Christmas 1942. This traumatic event haunts poor Mertens, and he decides to meet Brückner who currently has a successful business, a great family and a luxurious home despite the horrible events of the past. In this regard, Eric Rentschler has pointed out: ‘[Brückner] feels at home precisely because neither physical nor psychic ruins have a place in his prosperous new existence’. (Rentschler 2010, 28.) In a wartime flashback, Mertens tries in vain to change the uniformed Brückner’s plan to shoot the innocent civilians. In the end, Mertens decides to take revenge on Brückner, but Wallner runs into the scene and prevents the murder. As Major Bergmann in Rossellini’s film, Staudte presents Brückner as a manifestation of evil, who is clearly different than the protagonists. The character of Brückner also noticeably resembles Heinrich Himmler, one of the most powerful and most feared men in Nazi Germany. Therefore, in Murderers Among Us, there is also a clear contrast between the community and its enemies – in uniforms – who unjustly enjoy a luxurious life and haven’t taken responsibility for their actions. For spectators, a representation of the horrible past is personified as Captain Brückner, who is functional, as opposed to the traumatized Mertens, and especially to forward-looking Susanne Wallner. In the cultural heritage process, the main characters could act as unifying factors for the imagined community; cultural heritage is built on the basis of possessing identity work. Image 3. The ”Evil Other” in military uniforms (Captain Ferdinand Brückner in Murderers Among Us and Major Bergmann in Open City) as differentiating symbols that set the “enemy” characters apart from the protagonists. I have analysed these films from the viewpoint of the cultural heritage process and how these works can unite members of the heritage community, in this case, the nation and its film viewers who maintain the process. Because Rossellini’s leftists and Catholic characters, based on real-life historical figures, are meaningful symbols of the past and are part of the nation’s narrative, the shared history of the film can be used in monumentalizing the identity work of the cultural heritage process. The film constructs cultural heritage also by possessing identity work, which reinforces the heritage community’s involvement with these symbols. The film may also help the heritage community to remember the painful past, as with Pierre Nora’s Realms of Memory. Together, with a realistic story, the nation’s myths of redemption and suffering are well suited to highlighting Rossellini’s Catholicism. In the German rubble film, Murderers Among Us, the ruined landscape and the film’s wandering protagonist can also be seen as Realms of Memory, which unite the spectators in remembrance of the traumatic post-war past, even if the memories were not necessarily pleasing. These are adoptable traces of the common past for the post-war German nation, as a heritage community, to create unifying cultural heritage. In this case as well, I refer to the possessing identity work of the heritage community. As has become clear, the film is not based on the same kind of heroic symbols, religious myths or usable past, as in Open City, rather the people’s shared experiences of terrible war construct common identity. As Anderson would have put it, the spectators’ sense of community is imagined by remembering the common past. Both films represent “difficult heritage”, which shows the brutal side of history, which is also considered as cultural heritage. Like any national memorial, Murderers Among Us also takes part in the presentation of Germany’s history of suffering and, thus, also in the institutionalization of the Nazi past. The scene of renewal in Open City is an example of Rossellini’s religious views and the historicizing identity work of the cultural heritage process. When the struggles of the past are over, the nation as a heritage community may march towards a common future. The film creates a historical continuity, which can be used for identity work. Because of the traumatic past of the Nazi Germany, Murderers Among Us relies more on the hopeful future represented by the female character Susanne Wallner, while the past haunts the protagonist. As the film presents a common future of the nation as heritage community, the spectator’s sense of community is imagined. The film is participating in historicizing identity work, because it can also strengthen the spectator’s image of themselves within the continuity of past, present and future. In Open City and Murderers Among Us, mundane life, home, family and women, by excluding the outsiders, can act as unifying symbols for possessing identity work. In the films, characters who prefer a luxurious life, the cabaret girls in Open City and company owner Captain Brückener in Murderers Among Us, are set against the nuclear family. Visually, differentiation is clearly evident through the use of uniforms by the occupiers and the common enemies of the nuclear family represented by the abnormal Major Bergmann in Open City and the unsympathetic and Himmler lookalike, Captain Brückner, in Murderers Among Us. Against this background, differentiation confirms the spectator’s experience of involvement to the unifying symbols, represented by decent Italians and Germans. Thus, the spectators’ sense of community is imagined. Also in this case, the unifying cultural heritage of the nation is constructed by possessing identity work. These examples of Neorealism and rubble films participate in heritage building through monumentalizing, possessing and historicizing identity work of the cultural heritage process. They produce and maintain the cultural heritage of nations by interpretations of the shared history, experiences of involvement and symbols of unity and differentiation. The film can serve as a statement and observation of the time, because it has the ability to grasp the various phenomena and the nation’s history. Roberto Rossellini and others were able to find the elements from the nation’s past to create a sense of community, while Staudte’s Murderers Among Us went more towards a better future as the entire nation, even through the ruins, can also be seen as Realms of Memory. The female-dominated home can be seen as a symbol of unity, as in Open City; or as it appears in Murderers Among Us, as a mundane shelter from the nation’s enemies where it helps the film’s protagonists recover from the nation’s war trauma. Murderers Among Us (Die Mörder sind unter uns). Directed and written by: Wolfgang Staudte. Starring: Hildegard Knef, Wilhelm Borchert, Arno Paulsen, Robert Forsch. DEFA (Deutsche Film-Aktiengesellschaft). 1946. 85 min. Rome, open city (Roma, città aperta). Directed by: Roberto Rossellini. Written by: Sergio Amidei, Federico Fellini and Roberto Rossellini. Starring: Aldo Fabrizi, Anna Magnani, Marcello Pagliero, Francesco Grandjacquet, Harry Feist, Giovanna Galletti, Maria Michi, Carla Rovere, Joop van Hulzen. Excelsa Film. 1945. 103 min. “A Cultural Heritage Manifesto.” International Council on Monuments and Sites (ICOMOS). Accessed August 19, 2017. http://www.icomos-uk.org/uploads/sidebar/PDF/A%20Cultural%20Heritage%20Manifesto.pdf. Ahonen, Kimmo. 2013. Kylmän sodan pelkoja ja fantasioita. Muukalaisten invaasio 1950- luvun yhdysvaltalaisessa tieteiselokuvassa. University of Turku. Aitken, Ian. 2001. European Film Theory and Cinema. A Critical Introduction. Edinburgh: Edinburgh University Press. Anderson, Benedict. 2006. Imagined Communities. Reflections on the Origin and Spread of Nationalism. London, New York: Verso. Bacon, Henry. 1996. ”Maiseman muutoksia.” In Elokuva ja arkkitehtuuri, edited by Mikael Sundman, Maarit Henttonen, Tommi Lindh, and Kristiina Paatero, 68–77. Helsinki: Architectural Society. Baer, Hester. 2009. Dismantling the Dream Factory. Gender, German Cinema, and the Postwar Quest for a New Film Language. New York: Berghahn Books. Barzini, Luigi. 1991. The Italians. London: Penguin books. Baker, Mark. 1995. “’Trümmerfilme:’ Postwar German Cinema, 1946–1948.” In Film Criticism 20. Meadville: Allegheny College, 88–101. Ben-Ghiat, Ruth. 200. “The Fascist War Trilogy.” In Roberto Rossellini. Magician of the real, edited by David Forgacs, Sarah Lutton, and Geoffrey Nowell-Smith, 20–35. London: BFI Publishing. Bondanella, Peter. 2009. A History of Italian Cinema. London: Continuum International Publishing Group. Brunetta, Gian Piero. 2009. The History of Italian Cinema. A Guide to Italian Film from Its Origins to the Twenty-First Century. New Jersey: Princeton University Press. Brunette, Peter. 1996. Roberto Rossellini. Berkeley and Los Angeles: University of California Press. Cardullo, Bert. 2011. “What Is Neorealism?” In André Bazin and Italian Neorealism, edited by Bert Cardullo, 18–28. New York, London: Continuum International Publishing Group. Dickie, John. 1996. “Imagined Italies.” In Italian Cultural Studies, edited by David Forgacs, and Robert Lumley, 19–33. New York: Oxford University Press. Edensor, Tim. 2002. National Identity, Popular Culture and Everyday Life. Oxford, New York: Berg. Fehrenbach, Heide. 1995. Cinema in Democratizing Germany. Reconstructing National Identity After Hitler. The University of North Carolina Press. Ferro, Marc. 1988. Cinema and History. Original work, Cinéma et Histoire, published in French in 1977. Eng. Naomi Greene. Detroit: Wayne State University Press. Fisher, Jaimey. 2005. “Wandering in/to the Rubble-Film: Filmic Flânerie and the Exploded Panorama after 1945.” In The German Quarterly 78 (4), Focus on Film. Wiley on behalf of the American Association of Teachers of German, 461–480. Fisher, Jaimey. 2007. “On the Ruins of Masculinity. The Figure of the Child in Italian Neorealism and the German Rubble-Film.” In Italian Neorealism and Global Cinema, edited by Laura E. Ruberto, and Kristi M. Wilson, 25–53. Detroit: Wayne State University Press. Forgacs, David. 2007. Rome Open City (Roma Citta Aperta). London: BFI Publishing. Fulbrook, Mary. 1997. “Myth-Making and National Identity: the Case of the GDR.” In Myths and Nationhood, edited by Geoffrey Hosking, and George Schöpflin, 72–87. London: Hurst & Company. Gellner, Ernest. 2008. Nations and Nationalism. Malden: Blackwell Publishing. Hake, Sabine. 2004. German National Cinema. London: Routledge. Hall, Stuart. 1992. “The Question of Cultural Identity.” In Modernity and its Futures. Understanding Modern Societies, Book IV, edited by Stuart Hall, David Held, and Tony McGrew, 274–316. Cambridge: Polity Press in association with the Open University. Hoffmann, Hilmar. 1997. The Triumph of Propaganda. Film and National Socialism, 1933-1945. Providence and Oxford: Berghahn Books. Kracauer, Siegfried. 1966. From Caligari to Hitler. A Psychological History of the German Film. Princeton University Press. Kracauer, Siegfried. 1960. Theory of Film. The Redemption of Physical Reality. New York: Oxford University Press. Landy, Marcia. 2000. Italian Film. Cambridge: Cambridge University Press. Leikas, Lauri. 2016. 1940-luvun italialainen neorealistinen elokuva kulttuuriperinnön rakennusaineena. Master’s thesis. University of Turku, School of History, Culture and Arts Studies, Cultural Production and Landscape Studies, Cultural Heritage Studies. Liehm, Mira. 1984. Passion and Defiance. Film in Italy from 1942 to the Present. Berkeley: University of California Press. Logan, William and Keir Reeves. 2009. “Introduction. Remembering places of pain and shame.” In Places of Pain and Shame. Dealing with ’Difficult Heritage’, edited by William Logan and Keir Reeves, 18–39. Abingdon, New York: Routledge. Moeller, Martina. 2013. Rubble, Ruins and Romanticism. Visual Style, Narration and Identity In German Post-War Cinema. Bielefeld: Transcript verlag. O’Brien, Mary-Elizabeth. 2006. Nazi Cinema as Enchantment. The Politics of Entertainment in the Third Reich. New York, Woodbridge: Camden House. Overy, Richard. 2012. “Interwar, War, Postwar: Was there a Zero Hour in 1945?” In The Oxford Handbook of Postwar European History, edited by Dan Stone, 60–78. Oxford: Oxford University Press. Paasi, Anssi. 1986. “The Institutionalization of Regions. Theory and Comparative Case Studies.” In University of Joensuu Publications in Social Sciences N:o 9, University of Joensuu, Joensuu, 1–36. Piturro, Vincent. 2008. The Audience and the Film: A Reader-Response Analysis of Italian Neorealism. Denver: University of Colorado. Rentschler, Eric. 2002. “The Testament of Dr. Goebbels.” In Film and nationalism, edited by Alan Williams, 137–151. New Jersey: Rutgers University Press. Rentschler, Eric. 2010. “The Place of Rubble in the Trümmerfilm.” In New German Critique No. 110, Duke University Press, 9–30. Ruberto, Laura E., and Kristi M. Wilson. 2007. “Introduction.” In Italian Neorealism and Global Cinema, edited by Laura E. Ruberto, and Kristi M. Wilson, 1–24. Detroit: Wayne State University Press. Salmi, Hannu. 1993. Elokuva ja historia. Helsinki: SEA and Painatuskeskus. Sandford, John. 1980. The New German Cinema. New York: Da Capo Press. Schöpflin, George. 1997. “The Functions of Myth and a Taxonomy of Myths.” In Myth and Nationhood, edited by Geoffrey Hosking, and George Schöpflin, 19–35. London: Hurst & Company. Schmitz, Helmut. 2007. “Introduction: The Return of Wartime Suffering in Contemporary German Memory Culture, Literature and Film.” In A Nation of Victims? Representations of German Wartime Suffering from 1945 to the Present, edited by Helmut Schmitz, 1–30. Amsterdam: Rodopi. Shandley, Robert R. 2001. Rubble Films. Philadelphia: Temple University Press. Shiel, Mark. 2006. Italian neorealism – Rebuilding the cinematic city. Brighton: Wallflower Press. Sivula, Anna. 2013. ”Puuvillatehtaasta muistin paikaksi. Teollisen kulttuuriperintöprosessin jäljillä.” In Mitä on kulttuuriperintö?, edited by Outi Tuomi-Nikula, Riina Haanpää, and Aura Kivilaakso, 161–191. Helsinki: SKS. Sivula, Anna 2015. ”Tilaushistoria identiteettityönä ja kulttuuriperintöprosessina: Paikallisen historiapolitiikan tarkastelua.” In Kulttuuripolitiikan tutkimuksen vuosikirja 2015. Kulttuuripolitiikan tutkimuksen seura r.y, , 56–69. Smith, Anthony D. 1997. “The ‘Golden Age’ and National Renewal.” In Myth & Nationhood, edited by Geoffrey Hosking, and George Schöpflin, 36–59. London: Hurst & Company. Smith, Anthony D. 2000. “Images of the Nation. Cinema, Art, and National Identity.” In Cinema and Nation, edited by Mette Hjort, and Scott MacKenzie, 45–59. London: Routledge. Smith, Laurajane. 2006. Uses of Heritage. New York: Routledge. Smith, Laurajane, and Natsuko Agakawa. 2009. “Introduction.” In Intangible Heritage, edited by Laurajane Smith, and Natsuko Agakawa, 1–9. London and New York: Routledge. Sorlin, Pierre. 2001. “How to look at an “Historical” Film.” In The Historical Film. History and Memory in Media, 25–49. New Jersey: Rutgers University Press. Spinelli-Coleman, Donatella. 2011. Filming the Nation. Jung, Film, Neo-Realism and Italian National Identity. London: Routledge. Tuomi-Nikula, Outi, Riina Haanpää and Aura Kivilaakso. 2013. ”Kulttuuriperintökysymysten jäljillä.” In Mitä on kulttuuriperintö?, edited by Outi Tuomi-Nikula, Riina Haanpää, and Aura Kivilaakso, 12–27. Helsinki: SKS. Wagstaff, Christopher. 2000. “Rossellini and Neo-realism.” In Roberto Rossellini. Magician of the real, edited by David Forgacs, Sarah Lutton, and Geoffrey Nowell-Smith36-49. London: BFI Publishing. Williams, Alan. 2002. “Introduction.” In Film and Nationalism, edited by Alan Williams, 1–22. New Jersey: Rutgers University Press. Wood, Mary P. 2005. Italian Cinema. Berg, New York, Oxford. Wyke, Maria. 2008. “Italian Cinema and History”. In Theorising National Cinema, edited by Valentina Vitali, and Paul Willemen, 61–71. London: British Film Institute. Zavattini, Cesare. 1978. A Thesis on Neo-Realism. Springtime in Italy. Reader on Neorealism. Edited by David Overbey, 67–78. Hamden: Archon Books. Translated into English, the title of my master’s thesis is “1940s Italian Neorealist Films as the Builders of Cultural Heritage”. Originally in Finnish: “1940-luvun italialainen neorealistinen elokuva kulttuuriperinnön rakennusaineena”.